BlueBRIDGE has recently been engaged in developing distributions of biotic and abiotic parameters to be used in ecological models and climate change-related analyses. Forecasts in distant-time have been extracted from the textual data published by the AquaMaps Consortium and from the NASA Earth Exchange Platform. Through the BlueBRIDGE computational facilities, these data have been collected, cleaned, aligned, and structured in a way that made them directly usable in ecological models. Six distributions representing Sea Surface Temperature, Sea Bottom Temperature, Sea Surface Salinity, Salinity at Sea Bottom, Ice Concentration, and Primary Production were projected in the future based on the IPCC SRES A2 scenario. 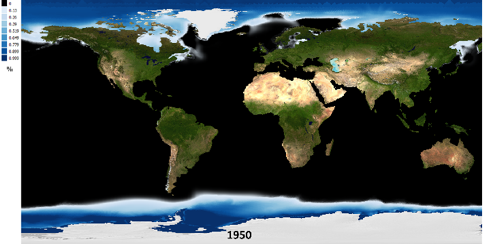 The primary sources of these data are The World Ocean Atlas, NOAA NCEP Climatology, SeaAroundUs, VLIZ, and the US National Snow and Ice Data Centres. Forecasted distributions for annual Average Surface Air Temperature and Precipitations were extracted from NASA by merging 20 general circulation models. Scenarios of medium mitigation of greenhouse gasses concentration (RCP 4.5) and of high greenhouse gasses concentration (RCP 8.5) were extracted for these variables. The other variables represent environmental parameters with loose- or no-dependency on time (e.g. depth, Marine Protected Areas, etc. ).